By Kevin Dinkins: Since destroying Lamon Brewster in six brutal rounds last month on July 14th, there’s been a tremendous amount of curiosity about who IBF heavyweight champion Wladimir Klitschko (49-3, 44 KOs) will elect to fight next. Of the names most bandied about, Corrie Sanders and Evander Holyfield have come up the most. Since Wladimir has a non-mandatory defense coming up, he’s free to take on a lower level fighter like these two, not that they’re not credible opponents, mind you, but clearly not at the top of the class at this stage in their careers. Normally, Wladimir would fight a lower guy, possibly someone in the lower top 10 or possibly as low as 14, but a big problem right now, unfortunately, is that many of the fighters in the top 10 are busy and have fights coming up. The fighters lower than that, however, are relatively unknown and not something that the cable networks want to see matched up with Wladimir, mainly because it won’t generate fan interest in wanting to view the fight. That’s where Holyfield comes in, and to a much lesser extent, Sanders, both of whom the fans might tune in to watch just for the spectacle of seeing them essentially be put out of their misery by Klitschko, whom at this point in his career is at the top of his game. To be sure, Sanders, 41, still has an incredible amount of power in either hand, but he’s been mostly in active for the past couple of years after retiring because of an injury to his back. In the time that he’s been away from boxing, Sanders has put on a great deal of weight and is reportedly weighing in the 250 range – 25 lbs over his optimal fighting weight. He’s had two fights during his comeback, and his still made little dent in paring off the extra pounds. Nevertheless, he’s still probably a very dangerous threat the Wladimir for two or three rounds, which as it turns out, was more than enough for Sanders when they fought in March 2003, when Sanders blasted Wladimir out in two rounds. Holyfield, 44, is the more intriguing of the two, mostly because he has kept in shape all this time, and has several decent wins in his comeback. Add to that, Holyfield has a large amount of public support, almost assuring that he can draw a large audience in a venue such as Las Vegas or Atlantic city. 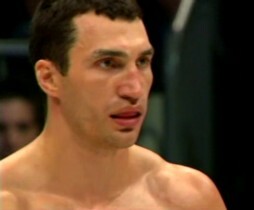 Boxing » Corrie Sanders » Wladimir Klitschko vs. Evander Holyfield or Corrie Sanders?